I didn’t know I could like laundry until I tried a Kenmore Elite. Obviously I still hate the parts of laundry that we all hate, the folding, and the putting it away. But I want to show you what happens when you turn on Kenmore Elite Dryer. Every time I turn the dryer off and on, I smile. It makes me think of the Jetsons, and that I’m living in some sort of super shiny space age house. I’m not, I’m living in Los Angeles, but please let me have a fantasy while I’m doing laundry. Here’s the bottom line. The folks at Kenmore were incredibly generous and they’re letting me test out an Elite Washer and Dryer set for a few weeks. When they first approached me I was excited for a number of reasons. I was also a bit unenthusiastic, because I have a washer and dryer. They wanted me to review their washer and dryer when there was absolutely nothing wrong with the washer and dryer that I already owned. Everyone knows that I love things clean. My kids know, my husband knows, my readers know, the other moms at little league know that I love clean clothing, and I’m not afraid to pull out the big guns to get it there. Well, I don’t really need the big guns anymore. When I did the first few loads of laundry I noticed that my clothes were different. My whites were whiter, so I stopped using the laundry boosters. My whites were still whiter. What I never expected to have happen is that my towels got a new life. My bath towels are not new, they were coarse and old, with the new washer and dryer I’m noticing that my bath towels are fluffy and absorbent again. I don’t know if I can attribute this to the washer or to the dryer. I know that a full load of jeans is dry within 25 minutes. That is amazing. My old washer and dryer would have taken an hour after I’d hung the clothes out in the sun for a preliminary drying. I used to unplug my washer and dryer after my chores were done. The older models use electricity even when they are shut off. The Kenmore Elite Washer and Dryer does not. I love that. I love it from an economical point of view, and also because it’s how appliances should be. Someone was asking me about mildew and black mold. 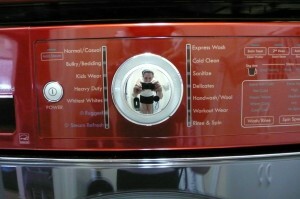 Right on the front of the washer is a sensor that lights up when it’s time to clean your washer. All front loading washers need to be cleaned now and again. Also, I’m told that because front loading washers have to have a very tight seal, you don’t want to be leaving wet clothes in them for extended periods of time (like days folks, not hours). If you love the web, you’ll love this set. I know, weird right? Wrong. Take a look at all these buttons! Buttons and lights and chimes. Really? What more could you want? It’s very intuitive and it’s smart. 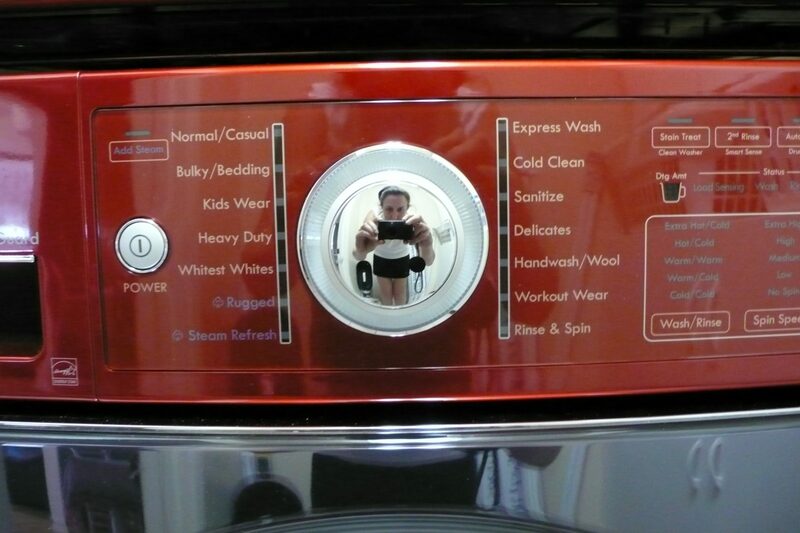 After you put your clothes in, there are a few little fake spins (did I mention it wiggles in different directions?) and I guess it must weigh things, because after that the little laundry cup gives you one, two or three bars. Accordingly, you add a small, medium or larger amount of laundry detergent to your machine. I suspect, though I’m not sure, that this feature is one of the reasons my clothes seem cleaner. Less residue if you’re using the right amount of detergent? I know that my friends at Sears don’t want to hear this, but the Kenmore Elite Washer and dryer is Home Economics for geeks. The washer moves in a million different directions, or seven… I can’t recall which. There is no vampire electrical use, it weighs your clothes and it greets you, and I smile like Pavlov’s dog because it reminds of the startup sound of a 14k modem. Mostly though, my clothes are cleaner and my gas bill has dropped significantly. I’m happy, and you can be too. This set is not inexpensive, but the way I see it, you extend the life of your clothes and drop your power bills. The set is near $2,500 and I think it’s worth every cent. Tomorrow I’ll upload a video about all the features of the Kenmore Elite washer and dryer, but in the interim I want you to know that you can win them. Go to KenmoreEliteSweeps.com and enter to win your own set. I promise you, you’re going to love it. This isn’t just another washer and dryer. *This post is part of a relationship I have with Kenmore. The relationship will never influence the content. Oooo, your post made me want to upgrade my “old” front load, energy efficient washer and dryer to this new, geeky, fun, beep-at-me set! I’m with you, they are not inexpensive, but worth EVERY penny along with the feeling you get from knowing that your clothes are TRULY clean! Your post makes me wish I had that washer/dryer! I am such a gadget geek and that is like a an epic geek toy! Thanks so much for sharing! My Samsung washer and dryer make lovely little music when they are turned off and on… That is only part of the reason that I love them so! Also being able to wash a king-sized comforter is another reason. I’m glad you like the Kenmore. Prior to our new washer and dryer, I’d never owned anything else. We have our starter washer and dryer from when we first moved in together. I have serious washer/dryer envy.